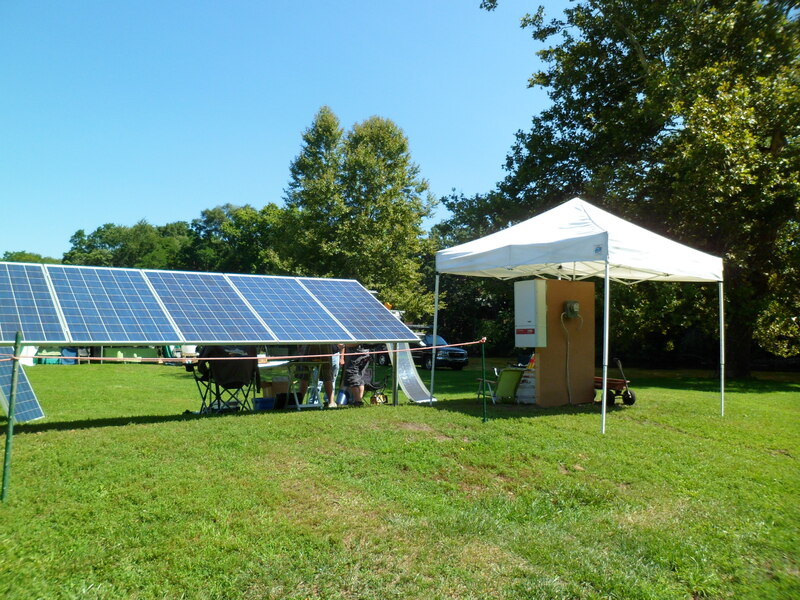 My friend Steve sent me this article the other day about Germany breaking a world record for the production of solar power, 5.1 TWh (tera-watt-hours) for the month of July 2013. What makes this amazing is that Germany get’s far less sun then the U.S. Even cloudy Michigan get about 4 hours of peak sun per day and Germany get’s 3 hours per day. 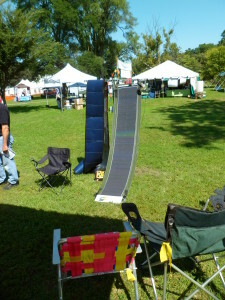 Here in Ypsilanti we continue towards our goal of getting a 1000 solar roofs. I was wondering if that happened, how would we stack up against Germany. Further down in the article it talks about Germany having 400MW of solar capacity per million people. Ypsi has about 20,000 people. If we could get 5KW on a 1000 roofs we would have 5MW per 20,000 people or 250MW per million people. So Germany as a country is doing far better than even the ambitious goal we have set. We need to install a lot more solar power in Ypsilanti, to even come close to Germany. My son and I always joke around with the phrase “killing polar bears” when one of us leaves the lights or TV on. We also use the phrase “burning dinosaurs” for driving in the car. Well the other day I put the two together and came up with “Burning Dinosaurs Kills Polar Bears” ™ and thought it sounded interesting and would make a great bumper sticker. With a small crew, we were able to install the system in one day and were up and running Friday morning. 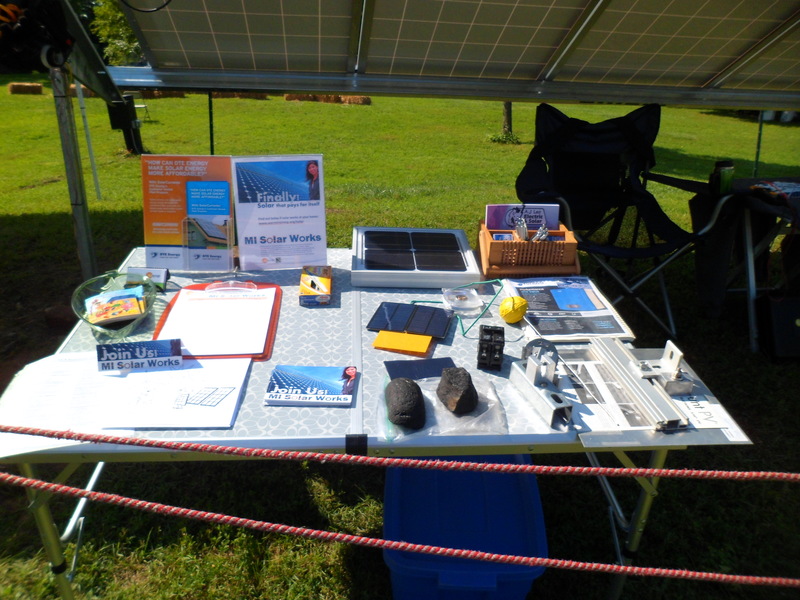 I counted about 400 people that stopped by and asked questions about solar power and how to install it on their homes and businesses. One person said that he came from Plymouth just to talk to us about solar power. It was a fun weekend and many thanks to Steve Pierce and Amy Strutz for hanging out at the booth and answering questions. We turned the system off on Friday at 5:00pm and the inverter showed that we had generated 36 KWH over the weekend. Riverside Park has three utility meters that feed the park and I read them before and after the festival. Not counting the generator near the beer tent, the festival consumed 1296 KWH over the weekend. So we supplied 3% of the power with our small solar installation. If we could have left it up for a month, we could have offset the whole festival. The system will be installed at the Fantasee Lighting warehouse in Belleville in the coming month and we’ll be adding it to the SolarYpsi website. Until then here are some pictures from the festival. Here are the solar panels powering our small “House”. We had a utility meter on the back of the house spinning backwards. 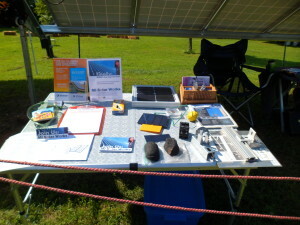 Table of different parts used in a solar installation with some product literature. 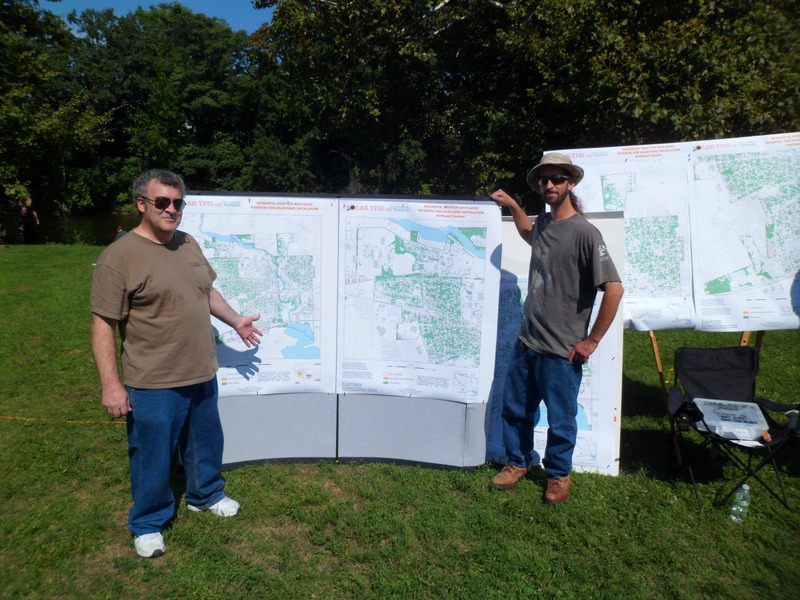 Here is a map generated by EMU professor Bill Welsh and his grad student Ben showing over a 1000 residential roofs with good solar exposure. 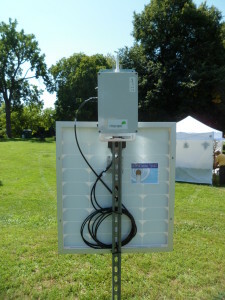 Once again WirelessYpsi was at the festival providing free solar powered wireless internet access.